The very successful Hampton 620 Pilothouse Motoryacht series continues to set the standards for build quality, interior spaciousness and overall Customer satisfaction. We are sold through hull 26. The Hampton 620 Pilothouse Motoryacht is the “Perfect Cruising Yacht”for cold or warm weather climates with features like its covered side and aft decks which offer protection from the rain in inclement weather and UV protection in warm weather. The recessed side decks which provide safe access to and from the foredeck and the dual transom access stairs and aft port & starboard side boarding gates which make getting aboard the 620 very easy. Also the dual aft deck helm stations with thruster & engine controls make backing into your slip a lot simpler. From concept to completion the Hampton 620 was designed to be a Safe, Comfortable and Easy yacht for a couple to operate. The main salon & lower deck arrangements are spacious and designed to offer the utmost in comfort and luxurious accommodations. The interior spaces are finished in the clients choice of either a satin or gloss handcrafted Makore cherry with Corian, Granite or Marble countertops. Each new Hampton 620 is offered with a custom interior by Pacific Custom Interiors of Seattle, WA and is tailored to the lifestyle's of our discerning clients. The engine room and lazarette offer stand-up headroom, generous storage and easy access to the ships electrical & mechanical equipment. The lazarette and engine room can be accessed via a watertight transom door or through a hydraulically operated hatch on the aft deck. The 620’s main deck offers covered walk around recessed side walkways, access to the flybridge from either the aft deck or the pilothouse, foredeck lounging area, a comfortable aft deck with entertainment & beverage center with a refrigerator & bar, recessed LED TV and a settee with custom cushions & a handcrafted cherry table. The aft deck also offers both port & stbd side boarding gates as well as dual curved stairs leading to the transom. The Hampton 620 offers an open spacious interior design combined with designer decor and quality mechanical & structural components that together create a gorgeous and safe offshore cruising yacht. The H620’s main deck arrangement begins with a comfortable aft deck featuring a forward facing settee w/cherry table, a wet bar w/beverage refrigerator, fold down LED TV and dual port & starboard boarding gates & 2 remote helm stations; moving forward you step into the spacious main salon that offers an open design that combines the main salon and pilothouse, creating a wonderful great-room style living arrangement. Salon features include a large L-shaped custom sofa accented with a cherry & redwood burl coffee table, 2 portside barrel chairs with a cherry table, a granite topped bar w/sink & wine captain, LED overhead and indirect lighting and an entertainment center that features a fireplace,abundant storage a 42” TV and Bose entertainment system that is connected to the standard satellite receiving system. A couple of steps forward and you are in the pilothouse with on deck galley. The galley is located in the aft starboard side of the pilothouse and features a heated granite sole, granite countertops w/serving bar & chairs and top end appliances that include SubZero, Fisher & Paykel & GE brands. The portside of the pilothouse offers access stairs to the flybridge, cruising/dining settee with cherry wood table, port & starboard “aircraft style” side-deck access doors and a center helm station with dual Pompenette helm seats. The lower deck arrangement starts in the foyer. The foyer features cherry & holly flooring with a granite & marble "Compass Rose" design centerpiece, an art nook and separate Bosch washer and dryer. Starting forward and moving aft, first is the V.I.P. stateroom which features beautiful Makore cherry cabinetry, LED lighting, queen side island bed, hanging locker, abundant cabinet & drawer storage, LED TV & Stereo/DVD system, skylight w/Ocean air screens and ensuite access to the guest head. Aft of the V.I.P. stateroom is the guest head. The guest head features granite countertops, wash basin, heated floor, Techma toilet and a large stall shower. Across from the guest head is the guest stateroom, this stateroom offers side-by-side single beds, LED TV with stereo/DVD system, reading lights, S.S. portlights w/screen, hanging locker and drawer storage. The guest cabin was thoughtfully designed to offer your family or guests comfortable accommodations. Aft of the guest cabin is the utility area that offers pantry storage and separate Bosch washer & dryer. Aft of the utility area is the “Full Beam Owners stateroom”; the Owners stateroom being full-beam is very, very spacious and includes an island queen bed, starboard side settee, (4) hanging lockers, one is a walk-in closet, abundant drawer and cabinet storage, dual port & starboard elongated stacked portlights which bring in abundant natural light. Other features include a portside vanity and a starboard settee, LED lighting & reading lights, LED TV with stereo/DVD surround sound system and an ensuite head. The well appointed ensuite head features a heated granite floor, granite vanity, Techma toilet and a large stall shower with “shower-message tower”. This is truly an incredible owner’s stateroom for a 62’ Motoryacht. Pilothouse: the pilothouse features a centered helm station with "Garmin" 8000 series navigational equipment, dual Pompenette helm chairs, custom interior helm windshield blinds, port & starboard "aircraft style" deck access doors, cherry & holly sole, cruising/dining settee with a beautiful cherry & redwood table, chart storage, storage drawers, air-conditioning, diesel heat, windshield defrosting system, access stairs to the flybridge and a u-shaped galley with serving bar. The U-shaped galley was designed to offer plenty of food preperation space, abundant storage and large enough so two chef's can whip up a meal together. Features include granite or Corian countertops (clients choice) with a serving bar & chairs, top-of-the-line appliances, overhead and under counter storage cabinets, pots-n-pans drawer and plenty of drawer storage. The bridge deck is accessible via the aft deck molded-in stairs or through the interior stairway from the pilothouse. The deck arrangement includes a fully appointed centered helm station including "Garmin" navigational equipment and dual Pompenette captain’s chairs, a large L-shaped settee with adjustable height table, food center with refrigerator/icemaker, hot/cold water, sink and BBQ. Other notable features include the hardtop, a custom fiberglass venturi w/safety glass, 1200lb Brower power rotation davit and a 12' AB hard bottom center console tender with Honda outboard. The electrical systems aboard every Hampton motoryacht are engineered to be dependable and offer ease of access to the main and sub panels located throughout the yacht. Engine Room; the Engine Room is well organized to offer stand-up headroom and ease of access around both main engines. The engine room features "Sound Down" noise abatement insulation materials to reduce vibration & noise emissions. This compartment like the rest of the yacht has been designed to be spacious, efficient, offering great LED task lighting and reasonable access to the ships machinery. The engine room can be accessed through the lazarette from either the watertight “aircraft style” transom door or the hatch located on the aft deck. Power for 620-27 is supplied by a pair of Cummins QSM11 715HP diesels coupled to ZF transmissions. Lazarette; the Lazarette offers stand-up headroom and like the rest of the yacht was designed to be spacious and offer easy access to the ships machinery and great storage. Both the lazarette & engine room areas can be accessed two ways; from either the watertight “aircraft style” transom door or the access hatch located on the aft deck. The lazarette houses the dual Glendinning cablemaster systems, Charles IsoBoost transformers, Hydronic diesel heating system, Magnasine 4kw inverter and Battery chargers. Features include finished side walls and cabinets, LED task lighting, watertight transom door, non-skid decking, AC duplex and door with viewing window for the engine room. The 620's Main Deck features dual transom stairs leading to the large aft deck and the wide recessed covered side decks making getting aboard and around the vessel very easy. 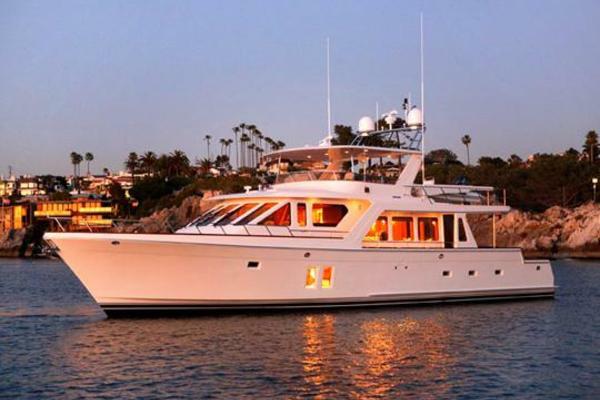 This yacht was designed with cruising couples in mind.... with it's aft port & starboard helm stations that feature ZF engine and SidePower bow & stern controls this is an easy vessel to dock. The H620 has proven to be another very successful pilothouse from Hampton Yachts. 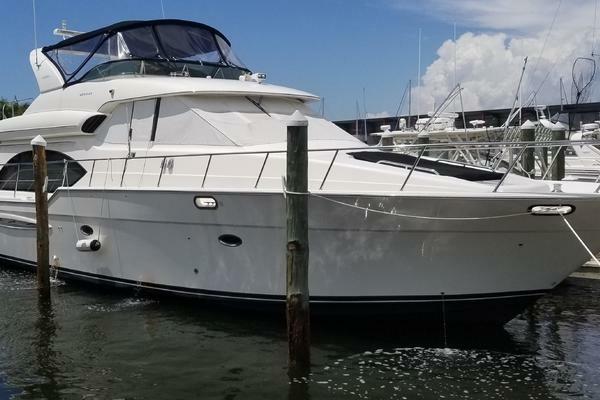 It has garnered the attention of clients whom have admired the company’s pilothouse cruiser series, but found the 680 & 740 a bit more yacht than they needed wanted a little more room that our 580 model. The H620 with all its great features such as the covered side & aft decks, the “Full-Beam Owner’s suite” and the spectacular open salon & pilothouse arrangement combine to make the Hampton 620 a great destination place where family and friends can join together for some great cruising and relaxation.